Valentines Day was magical this year, filled with rose petals, and love songs. As you might expect. Wait, no, it wasn’t. Bob and I aren’t the kind of people to be hung up on calender dates. Valentines Day brought roses, lemon squares (a weakness of mine, handmade by Bob), and some great downtime before I headed to work. That’s the reality of working two jobs and being a student. This too shall pass. What was really special was the day after Valentine’s. Sunday the 15th. Bob and I had been talking about making time for adventure in our own city, and enjoying what the prairies have to offer. We do quite well! So, we decided to snowshoe as our main plan for the day. Anything after that we would just decide as we went along – these are the plans I love. I feel like this Valentines date was reminiscent of our Tofino trip, in that I have been on a scallop kick ever since our first impeccable dinner at WOLF in the FOG. Bob, of course, was more than willing to accommodate me. Also, I don’t often pursue adventure in Saskatoon. I think it’s an easy trap to fall into, just living day to day life without taking the time to enjoy what’s around you. We decided to change that. 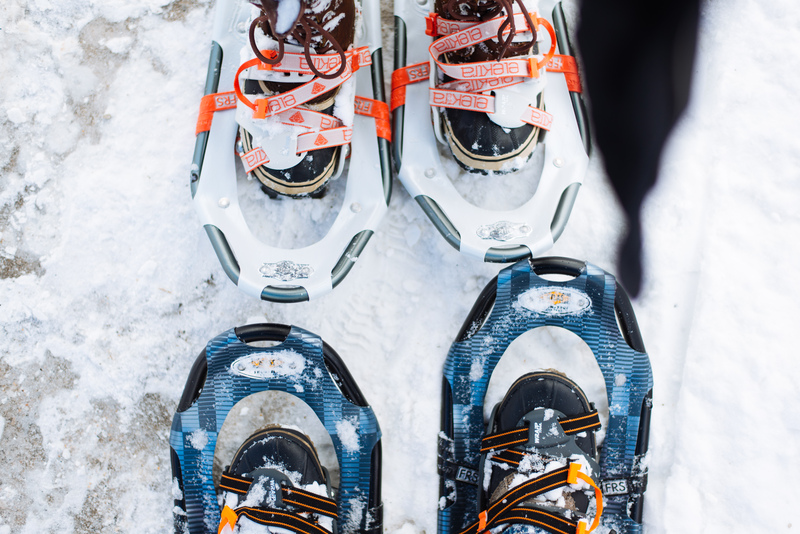 Early that afternoon, we set out to Deifenbaker Park with borrowed snowshoes and light feet. To start with, that is. Snowshoeing proved to be a great light workout! During our walk, we really enjoyed the paths alongside the South Saskatchewan River, and even on the frozen river itself. February in Saskatoon is brisk, to say the least. Photos of our afternoon may or may not show me pushing my limits further off the trail – that seems to be a recurring theme. As for dinner, I feel there’s nothing better than a hearty meal, featuring purple kale, baby potatoes, radish, and those scallops I crave so much. We had some ingredients on hand, and picked up those luscious scallops from Bulkcheese Wharehouse near Bob’s place. (P.S. I love you, scallops) Bob took initiative on dinner, and I worked alongside making Old Fashioneds, a classic favorite of ours. Bourbon, lemon bars, and scallops appear in this post and that makes me so happy. These elements, along with Bobby, make me a little weak kneed. Dinner was finale to a great weekend, despite working on Valentines. Enjoying day to day is what matters! Also, scallops.